Since I bought myself my Bernina sewing machine (Bernette 15) a little over a year and a half ago, I have been dreaming of making it it’s very own cover. One that not only protected it from the dust, and the odd bump around when I take it for it’s check-up or to lessons, but also one that was unique and reflected my own personal style. You see, my sewing room is the only room in the house which belongs totally to me and thus I can decorate it however I like. For years I have been simplifying my personal style, to make our house ‘male friendly’. This lovely chaise (another IKEA purchase), was in fact the only piece of furniture, that we had bought as a newly-wed couple, that I really loved . When we converted our office into my sewing studio, I knew it would be the perfect place to curl up on a Sunday afternoon, flipping through magazines or reading a good book. This chair of course has naturally become the inspiration for how I am decorating my sewing space and thus has been the inspiration for my sewing machine cover . 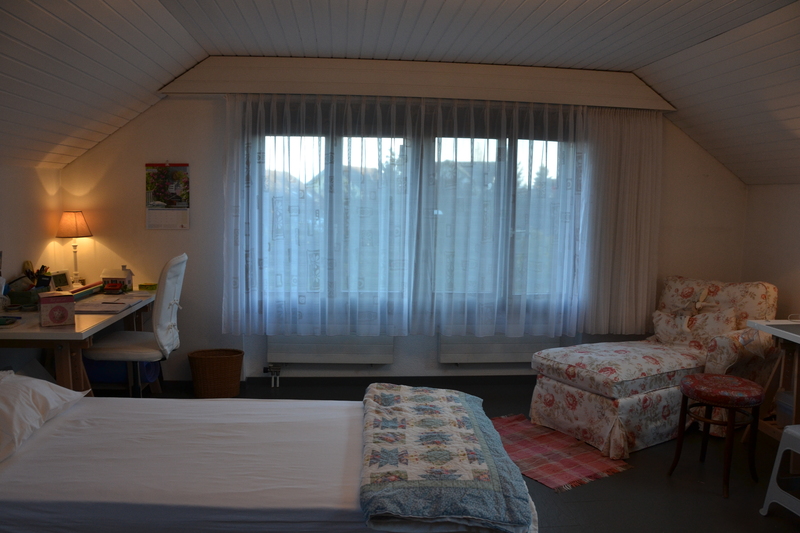 In the summer, I bought this lovely fabric and the coordinating charm packs from The Quilt Place, here in Switzerland. The fabric is from two lines from the quilter and fabric designer Joanna Figueroa at Fig Tree & Co. Do I need to tell you how muchI love her fabric!!!! 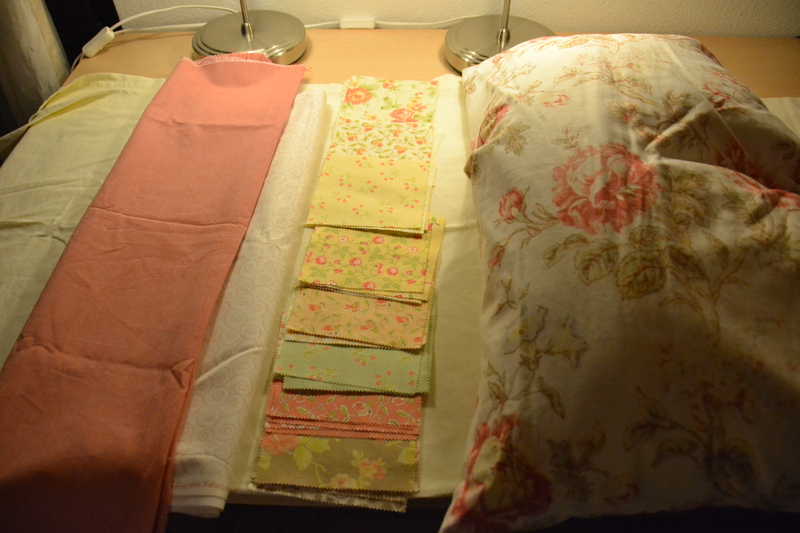 I had bought the fabrics to make a quilt, but as they still sat on my shelf, unused, many months later, I decided to use the charm packs to make a sewing machine cover. I loved this sewing machine pattern from Ros at Sew Delicious (click here for the tutorial). 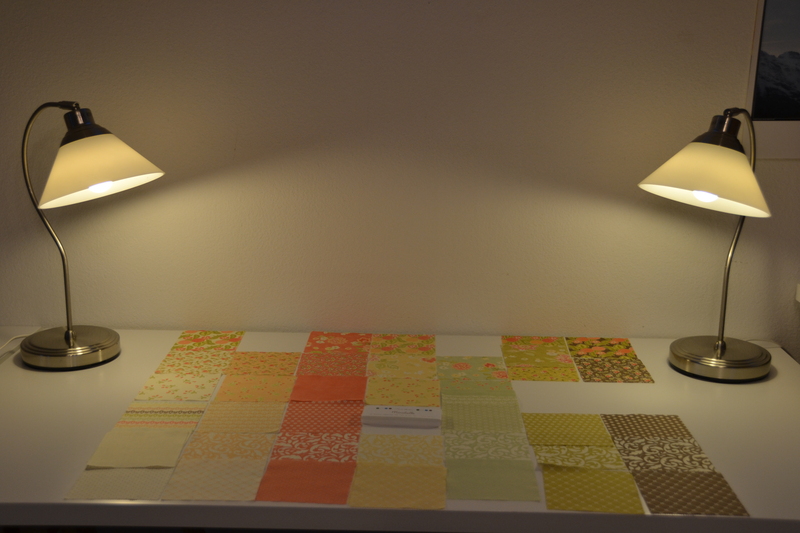 So the design process began, and I got more and more engaged in the process of auditioning fabrics. Until my husband determined, that I was never going to finish because I enjoyed this part of the design stage, too much. deciding these ones, would have to stay out of the equation as they simply didn’t go with my inspiration fabric from the chaise. So then I had this, which was either too many charms or too little, don’t remember now. Many combinations later, (I don’t think I even bothered to take photos of the actual ‘auditioning’, because I was never really happy with them,) I decided that for me, it was a shame to put all the charms next to each other. 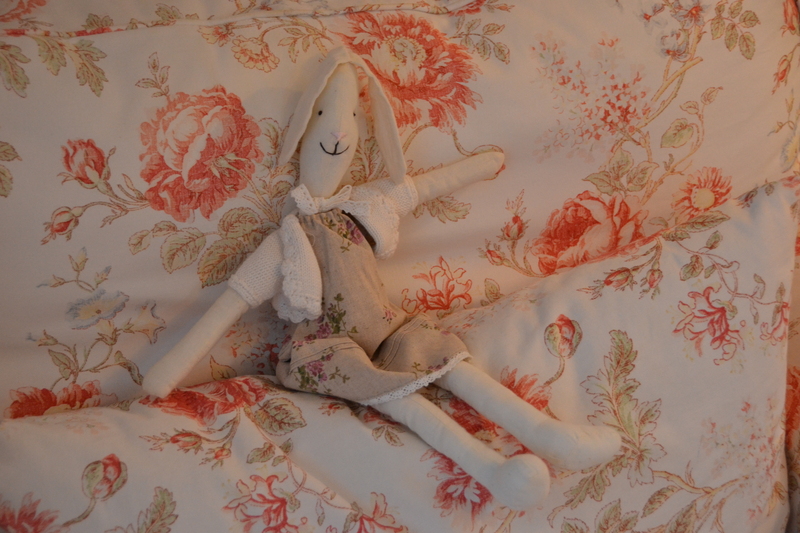 They needed some sort of neutral fabric to ‘rest the eyes’ and really show them off, as they were all so lovely. After taking a lot of prodding from my husband, (you know the very passive kind where he keeps entering the sewing room and looking desperately for some progress in your recent project and disappointed, retreats) I was forced to finally make a decision. I had had this solid, cream colored, natural woven fabric for a while. 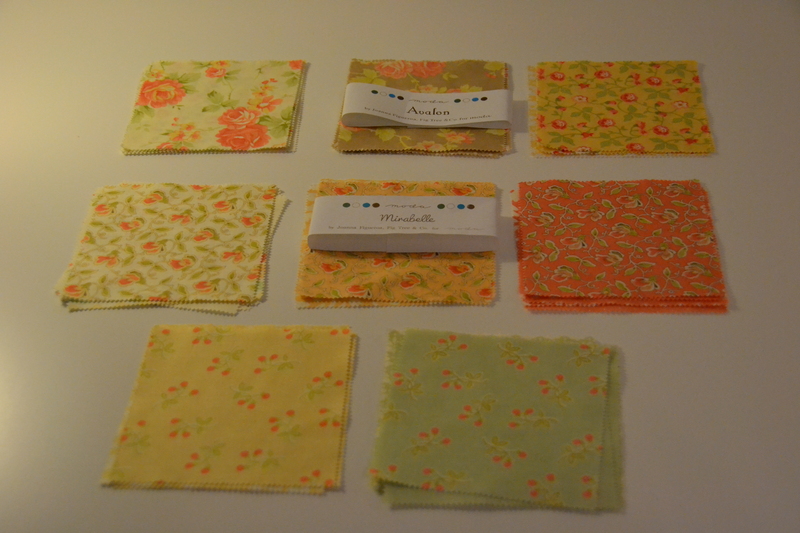 So rather than cutting into the yardage I had intended to use with these fabrics, I chose that. Finally, I decided on an arrangement and sewed them together. But once I started to sew together the squares, I realized some puckering going on at the seams and so decided to use that for backing a quilt. 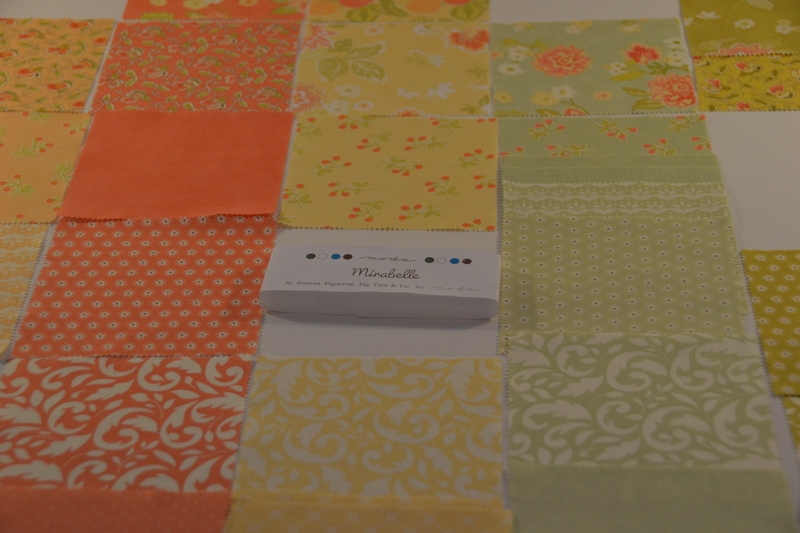 By that time I just wanted to finish the project and so chose a much easier pattern , as it didn’t require any quilting, and at that point, after spending days playing with fabric, I decided to just use the yardage I had bought originally for the quilt. Well I am going to have to stop here as this post is getting too long. 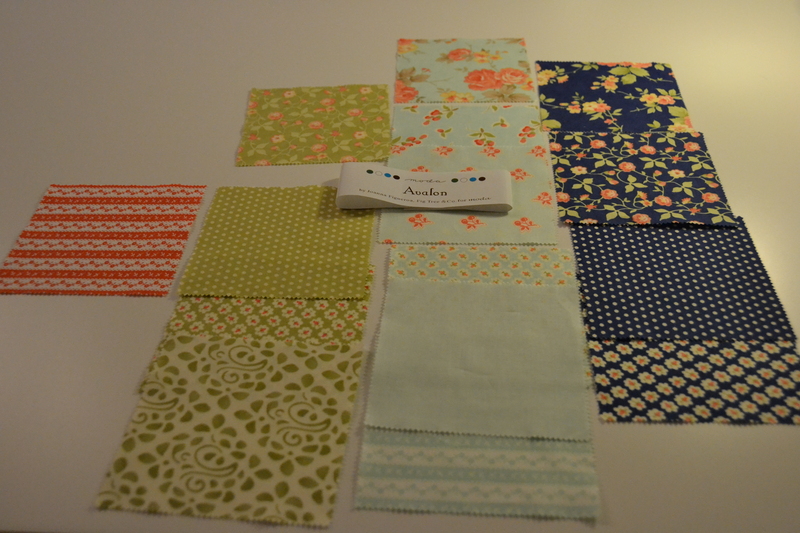 Stay tuned for part two in my adventure with charm packs / sewing machine cover story! 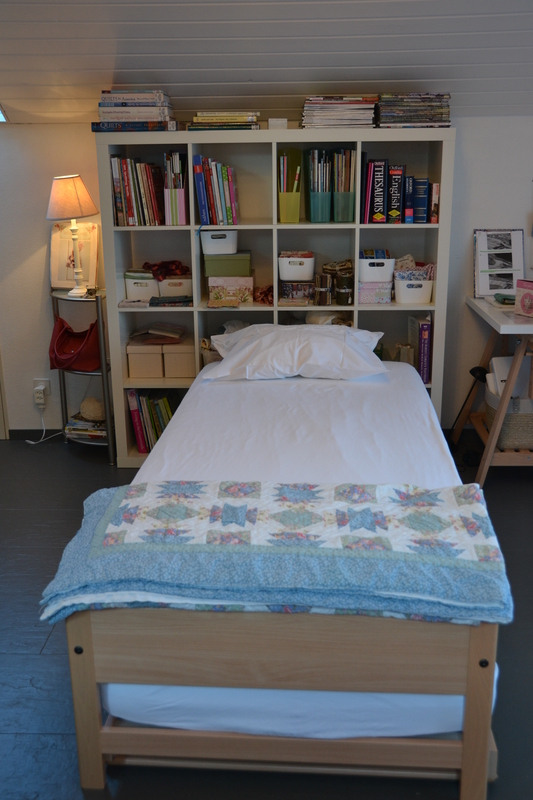 Your sewing room looks lovely Jodie, and the chaise is the perfect place to curl up with a magazine or book. You are such a tease not to show us your finished cover – I’ll be tuning in for the next bit! Ok ok, I know, just recovering from the last photography uploading session!!! I love the chaise, too. I have read backwards, and am enjoying reading the story of your sewing machine cover. The final product (in the previous post) looks great! By the way, I should tell you that I often don’t return to a post where I’ve commented, so if you want a conversation with me, or just want me to see your response, if you could do me a big favor and send it to my email. Then I’ll see it there! Many many, thanks!